This is a stunning outdoor item of furniture that can upgrade your hosting capabilities, create new opportunities for romantic evenings around the home, or even just give you a place to relax on your own with your thoughts. Many people sadly underuse their gardens. A garden should not just be something nice to look out from indoors – it should offer you a Zen space to relax and unwind in, and to feel completely at ease and immersed in nature. Few ideas encapsulate this more than the thought of sharing a glass of wine with your other half while watching the sun set on a Friday evening. 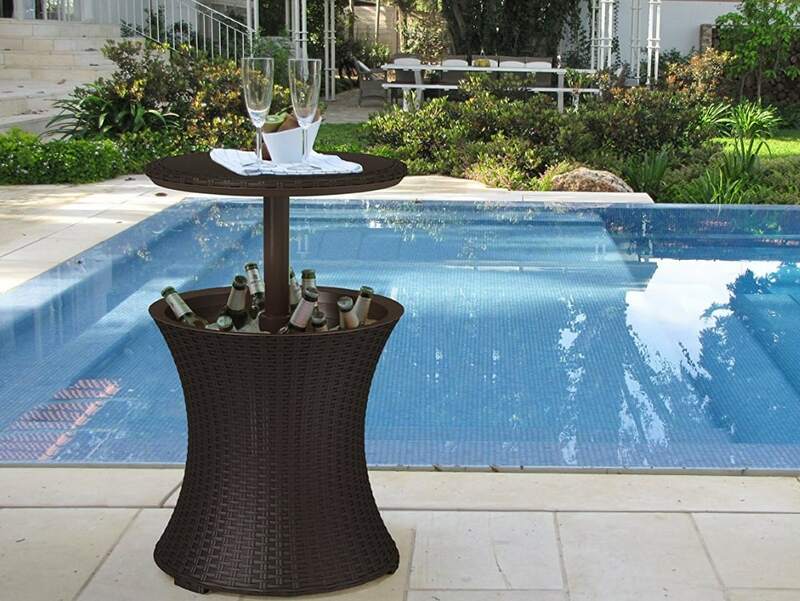 That’s what this cool bar is all about – a rattan style feature for your garden that offers a small table for standing two glasses and a built-in cooler where you can keep some ice and some bottles. The cooler table can keep your bottles cold for hours and is large enough for plenty of beverages at 7.93 gallons. The design is highly attractive thanks to the dark brown color of the rattan, and the curved edges of the base. The table also closes by sliding downward allowing it to serve as a lid for the cooler and to take up less space in your garden. In short, this is a nice looking short coffee table when not in use as a cooler, and a great feature for barbeques and outdoor meals when erected. The main feature of this table is its ability to go from coffee table to bar table and back again, while also housing the built-in cooler. This design solves the problem of not wanting to keep your bottles outdoors because it provides a closed lid when not in use to protect from the elements. Not only that, but several other features also make this a particularly good cooler. For example, a drain plug makes it very easy to remove the liquid and to clean up, which is something that not all similar products remember to include! This product appears to be making its users very happy indeed with an average score of 4.5 stars based on 984 reviews at the time of writing. This is a great score and something that you don’t see often for similar products. Reviewers liked the dual function of the table and the overall design, noting that it added to the look of their garden patio. One reviewer noted how good it was for entertainment purposes, and how it had held its look for the two years that they have had it, and how it is a great way of providing extra fridge space when having a party. One of the few negative comments pointed out that the pictures on the listing did not clearly show the silver circle in the center of the table at the top. This won’t bother most people, but it’s worth noting before you go ahead! In conclusion, this is a great option for anyone who enjoys hosting in their garden, dining outside, or just enjoying a few drinks with their other half. It has a stylish design and clever functionality which means it will perform as good as it looks and potentially upgrades your evenings and your barbeques! Buy the Keter Pacific Rattan Style Outdoor Cool Bar Ice Cooler Table Garden Furniture - Anthracite product on Amazon.co.uk using this link.